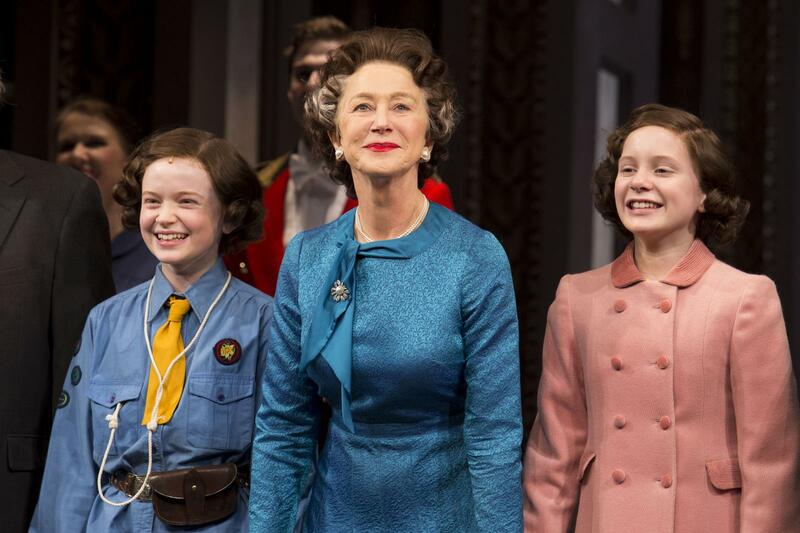 Photo Associated Press: From left, Sadie Sink, Helen Mirren and Elizabeth Teeter appear on stage at the Broadway opening night curtain call of “The Audience” at The Gerald Schoenfeld Theatre on Sunday, March 8, 2015, in New York. Dame Helen Mirren is impressing audiences and critics for her portrayal of Queen Elizabeth II once again, but this time it is not on the screen it is on the stage. The play is the Peter Morgan’s the Audience, directed by Stephen Daldry playing at the Gerald Schoenfeld Theater in New York. Helen Mirren sparkles in the role of the Queen for which she won an Academy Award for her portrayal of Elizabeth in “The Queen” in 2006. The movie was also written by Peter Morgan. Now the 69-year-old year old actress has also been nominated for a Tony Award for best actress in a play. It would be an incredible achievement to win both an Oscar and a Tony for the same character and not just any character, the current reigning monarch of Mirren’s home country! The play, inspired by the private weekly meetings between the Queen and Britain’s 12 prime ministers over her six-decade reign, has been both a critical and commercial success already recouping the $3.4 million spent on production costs. Recouping the investment after just five weeks after its official opening, proves that audiences are once again connecting with this story and no doubt Helen Mirren in the lead role is a major draw. In fact the production is playing to 100 percent full capacity since the beginning and earning over $1 million every week. The Audience on Broadway will run till June 28, so do not miss it. It has also started on London’s West End on April 21, with Kristin Scott Thomas as the Queen.